To all our readers who’ve served, we wish you a peaceful Veteran’s Day. To all our Californian readers, we hope you’re safe and secure. With the exception of Jerry Dipoto doing Jerry Dipoto things by making a trade with the Rays, this part of the offseason is fairly quiet. Teams are still figuring out their plans for next year and are just starting to earnestly pursue their free agent targets. There’s also the slow creep of the awards season, which’ll give us something to talk about for, like, a day. As an aside, how silly is the concept of awards finalists when the results are already in? I get that MLB wants buzz around its awards, but shouldn’t there be some sort of re-vote if there are finalists, like some sort of run-off election? Anyway, the relative quiet also extends to the goings on of the Yankees, so I’ve got two main thoughts on this mid-November morning. What is it about former MVP, right handed sluggers that gives Yankee fans and media brain worms? For years, we had purely academic debates about the benefits and “drawbacks” of Alex Rodriguez’s status as a Yankee, and now some of the same stuff is cropping up around Giancarlo Stanton. I’ve now heard not one but two radio hosts float the idea that Stanton isn’t a good fit here and that trading him to the Dodgers is the right idea. One of those hosts is the Yankees’ main play-by-play announcer and watches Stanton play every day, yet still feels like there’s not a fit. That is lunacy. Yes, it’s my own fault for even listening to sports radio in the first place, but sometimes, I just can’t help myself. I’ve tried to reduce my hate-consuming and mostly have done so, but sports radio is just too hard to fully quit when you commute to work in a car each day. Anyway, Giancarlo Stanton just had a season in which he hit 38 home runs and racked up a 127 wRC+. Is that latter number a bit off from his career norm? Yeah, sure, but it’s still pretty damn good. 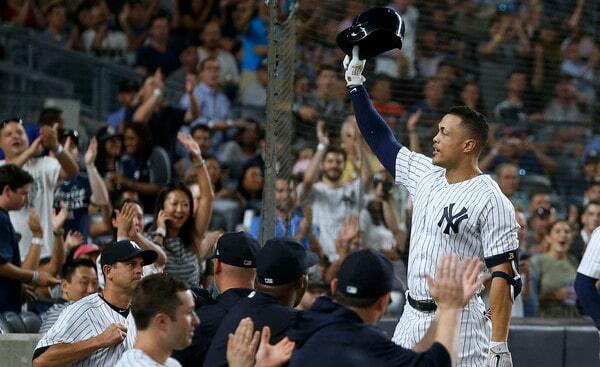 He also played in 158 games, including a stretch of over 80 straight, during which he was hurt and still carrying the team through a rough stretch without Aaron Judge or Gary Sanchez. If that doesn’t give the guy credibility with you, then that’s a you problem and almost nothing will satisfy you. There are few right handed power hitters in baseball as good as or better than Stanton and the Yankees are lucky to have him, especially considering the minimal trade cost it took to acquire him. With an offseason of rest and the time to make adjustments to his new league, he’s going to come out firing in 2019 and is going to make at least two radio hosts look foolish for doubting his fit in New York. Plan 189. Plan 197. A rose by either name would smell as foul. For the better part of a decade now, we’ve been hearing about the Yankees’ plan to get under the luxury tax threshold. At the outset–and in a vacuum–it’s not a bad idea. The Yankees had a lot of high-priced players nearing the end of their careers and needed to trim that and infuse themselves with young talent. They were certainly able to do that. What stood on the horizon was the other part of the justification for the richest team in baseball, in the sport’s biggest market, with one of the most lucrative TV contracts, etc., etc. : the future flexibility to splurge on free agents. They have that now. But they’ve just moved the goalposts. The company line is now about not letting other teams use the Yankees’ luxury tax payments to compete against the Yankees. Okay, fine, I can sort of buy that, but it all amounts to less money for players and less satisfaction for fans. And, let’s be honest, most of those owners are just going to pocket the money anyway instead of reinvesting it on the field. Many have written this off as posturing, part of the negotiation process, but I’m not sure just how much I buy that. We’re in 2018-2019 now. Everyone knows what everyone is doing. Everyone has a smart front office. I’m not sure there’s much benefit in the posturing when it comes to free agent negotiations like there would be in trade talks. 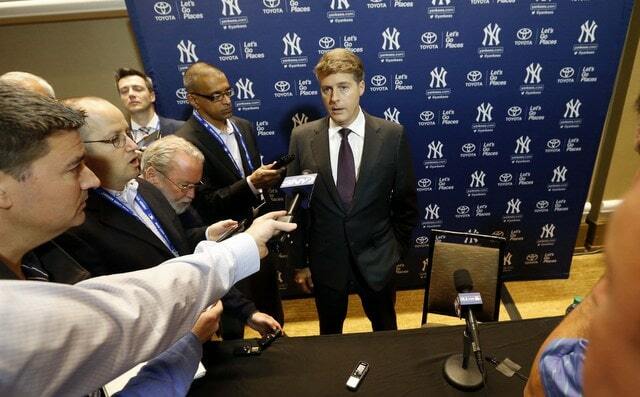 It’s not my money and the Yankees are free to spend–or not spend–however they please. But we’ve definitely ordered one meal and been given another, and there’s no waiter whom we can complain to to fix it. I hope I’m wrong and the Yankees do open the checkbook, but I’m not going to hold my breath anymore.